Are you all sick of seeing this yet? I know I'm struggling with ways to photograph it that feel interesting. Fortunately, I have just three more inches left on this sweater front. It worked out that each green-pink stripe is one inch, which makes measuring super easy. I've been struggling a bit with this sweater, and I don't really know why. 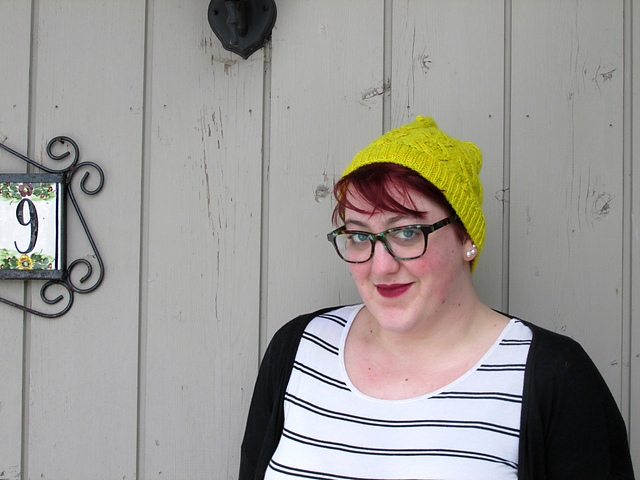 I love the stripes - they're perfect potato chip knitting - and I can't wait to have this finished sweater in my wardrobe. I'm probably just tired in general. The library eats up my daytime hours, and I'm in the middle of production on this play, which eats up most of my free time, and when I have time to myself in the evenings, I just want to snuggle the dogs and recharge. 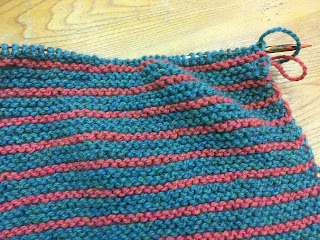 So anything that can't get knit during lunch and rehearsals isn't getting knit, and my progress is really slow.